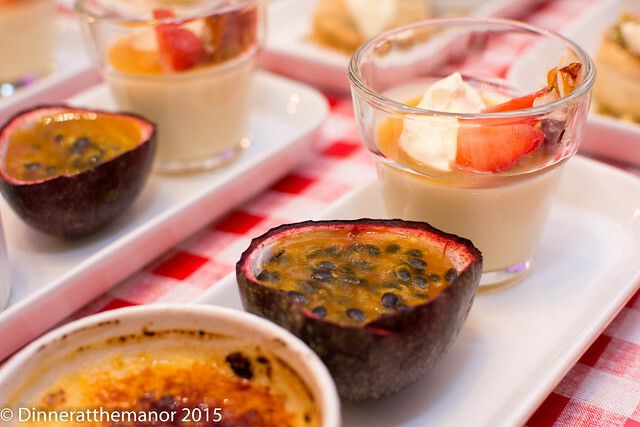 Back in mid July, we kicked off our summer run of events at the Manor with a French feast to celebrate Bastille day. We wanted to bring some familiar French classic flavours, but with a twist. 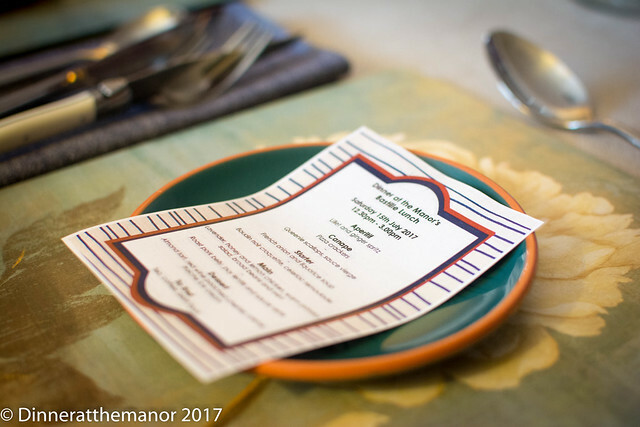 We didn’t base the whole supperclub on a particular book, but many of the dishes did come from the likes of Rachel Khoo and Rick Stein. Guests were welcomed with a refreshing Lillet and ginger spritz. Lillet is a French vermouth, quite sweet, tangy and floral. 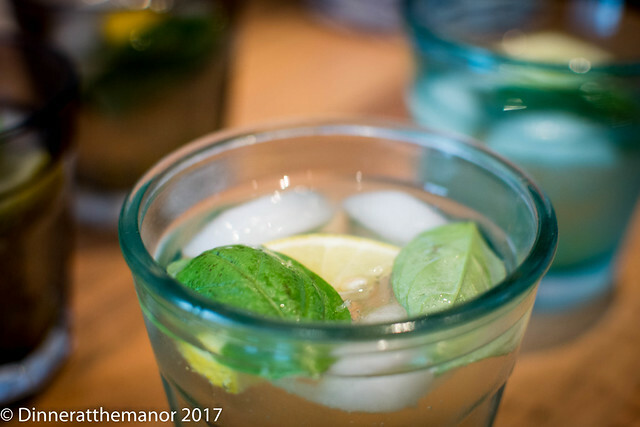 This longer drink came with lemon, basil, preserved ginger and sparkling water – very refreshing and tasty! 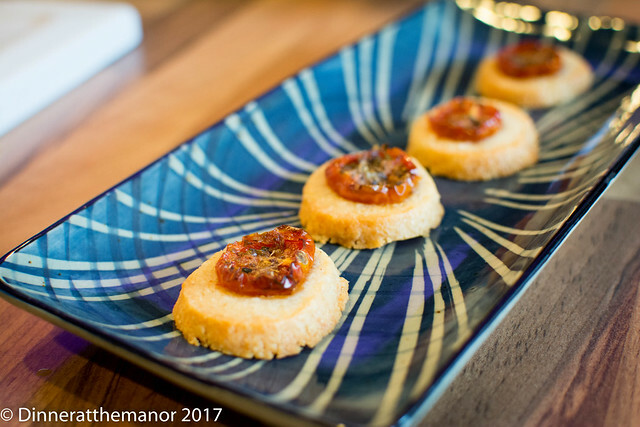 Our canapés included “pizza crackers” – mini cheesy shortbreads topped with slow roast tomatoes. 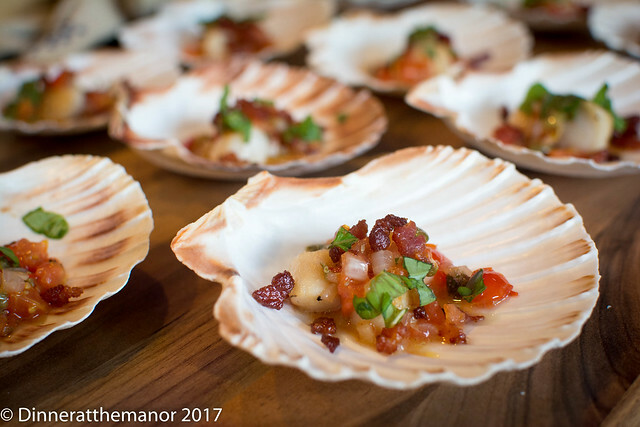 The second canape was a delightful combination of queenie scallops and a zesty sauce vierge. The sweet scallops paired well with the tang of the tomatoes and the saltiness of the capers in the sauce. 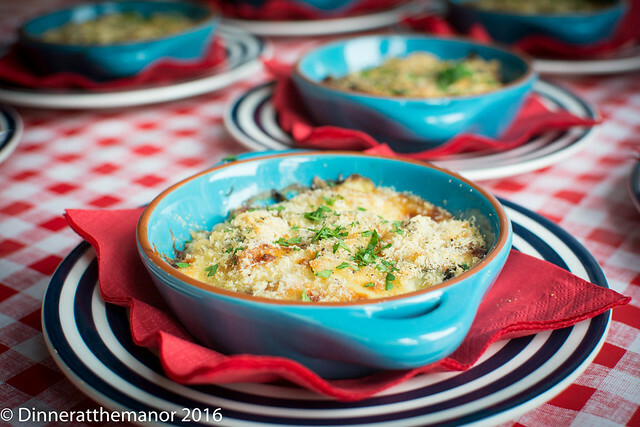 The first starter was a French classic, onion soup – but with a twist! This version came with at least five onions (white, spring, shallots, garlic, pickled) and the slightly unusual addition of liquorice. The liquorice was not over powering but gave a smooth, salty, aniseedy finish to the rich soup. 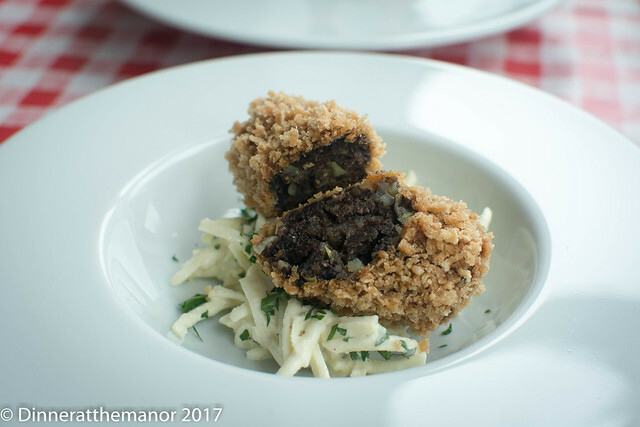 This was followed by a boudin noir croquette with celeriac remoulade – essentially a celeriac coleslaw made with creme fraiche and lemon zest, which cut through the soft, salty richness of the black pudding nicely. Onto the mains, which started with a delightful dish of lavender, honey and lemon chicken. Floral food haters need not fear, the lavender was not flowery at all – and the chicken was marinated in a fair bit of it! In fact it imparted more of a deep, smoky flavour. 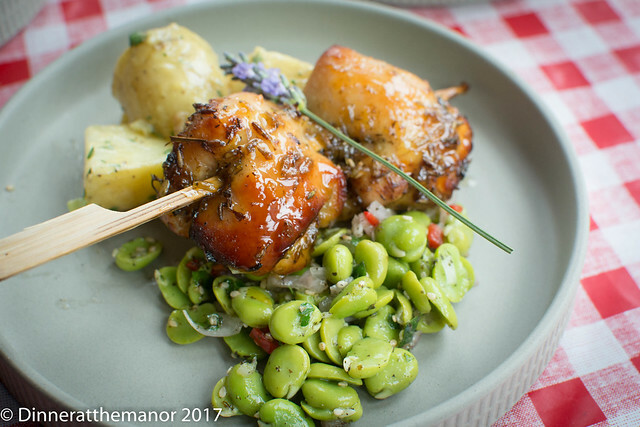 The chicken came with a warm, mustardy potato salad and freshly podded broad beans. The second main was a hearty “peasant” style dish of crispy pork belly, lentils and a sauce verte. 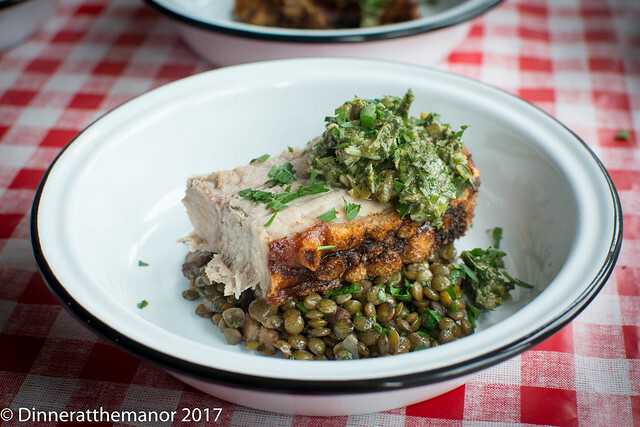 Another hearty dish, with the soft and crisp belly, bacon and wine rich lentils cut through with a herby green sauce of parsley, capers, anchovies and mustard. 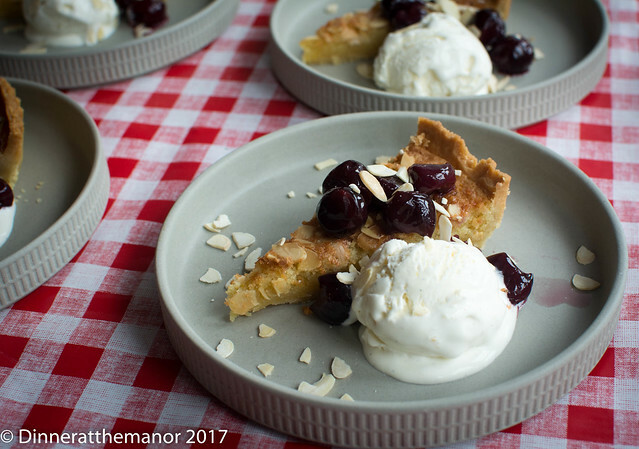 Hopefully our guests weren’t too full by the time we got to dessert, which was a sweet, nutty and crisp almond tart paired with merlot poached cherries, creme fraiche ice cream and toasted almonds. 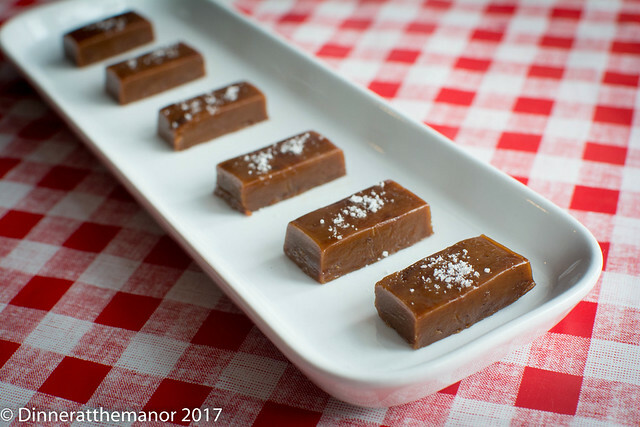 Our final flourish were the petit fours which were home made caramels spiked with warming spices and sea salt crystals. The was an enjoyable and laid back event to kick start the summer, with a wonderful array of guests old and new having travelled as far as the US! In a couple of weeks we’ll be hosting our vegetarian fine dining events. We’ve pulled together our menu and all it’s very exciting. Also, we’ve just about agreed on dates and themes for our autumn / winter events for 2017 and they’ll be on sale soon…Get in quick as I’ll be off having a baby, so a short break, before heading back into hosting in Spring 2018!! 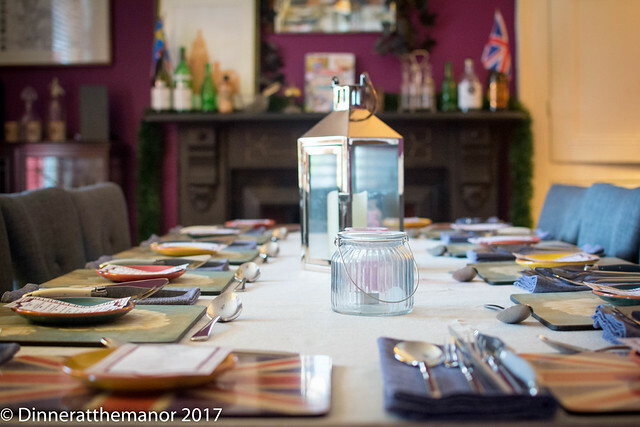 This entry was posted in Past Events, Reviews and tagged 2017 Dates, Dinner at the Manor, French, French Food, Supper Club, supperclub, Underground Dining, Underground Restaurant, Yorkshire on August 6, 2017 by Susie Barker. 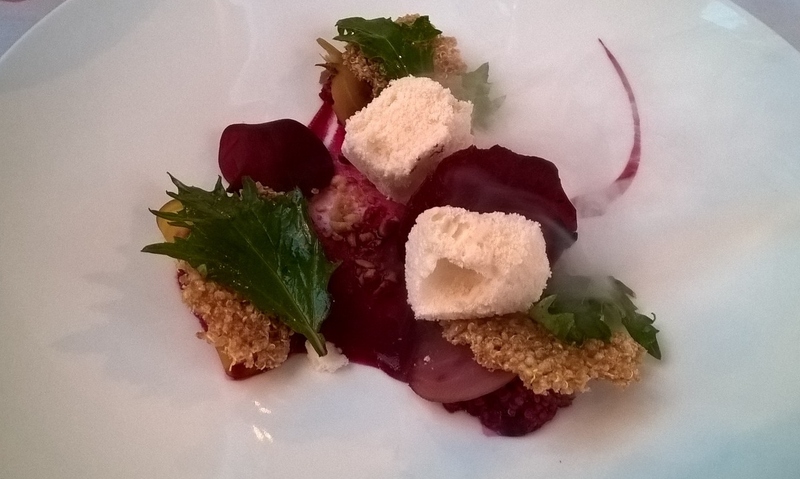 We had the pleasure of trying Leeds’ latest pop up restaurant this week and it was a very exciting meal indeed! The city’s very own Liz Cottam, who came fifth in this year’s Masterchef, has been looking for the ideal location to host her own restaurant. After much deliberation Liz confirmed her residency at the New Ellington hotel just a few weeks ago. A beautiful venue, but a little off the beaten track, we were keen to see what plans Liz had for the place. 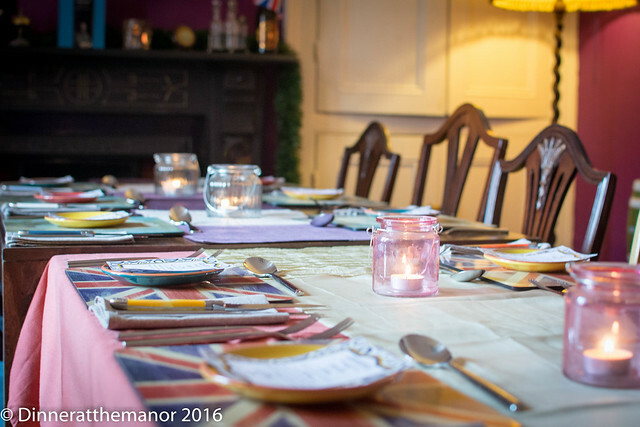 We’ve dined with Liz before – she runs her own adhoc supperclub from her gorgeous house in Gildersome. Her atmospheric, panelled dining room is more Manor than the Manor – so maybe she’ll let us do a residency at hers whilst she’s busy at the New Ellington?! The few times we’ve eaten Liz’s food I’ve always been amazed by her attention to detail with the intricate plating up – given she’s an amateur after all – and the lovely flavours she carefully and thoughtfully brings together. This translated well into her first proper restaurant service, with dishes that felt high end, luxurious and tasty. First up at her launch meal we enjoyed a mushroom consume with mushroom puree, gnocchi and shavings of truffle. This was an umami smack in the face, if ever there was one, and the strong truffle certainly elevated the dish to a luxurious standard. Next up was Liz’s take on a very refined fish pie. 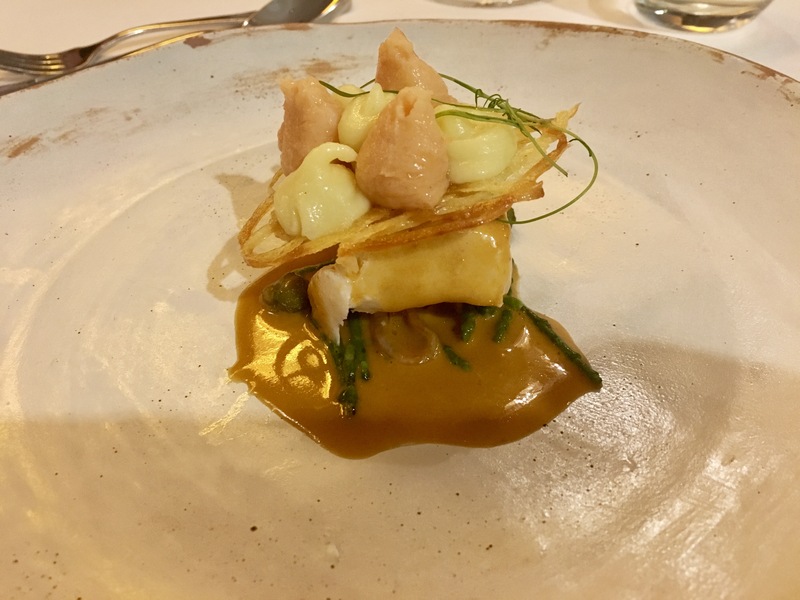 Soft, buttered halibut was swimming in lobster bisque and topped with a crunchy potato crisp, delicate mash and pickled samphire. This was a decorative dish for the eyes and delicious on the palette, with comforting and warming flavours of the sea. I’d seen Liz show this dish off on Twitter so was thrilled to be able to try it. Liz’s main was a superb offering of lamb. First up was a piece of rolled lamb belly that had been slow cooked for 32 hours and topped with harissa spices and pistachio crumb. 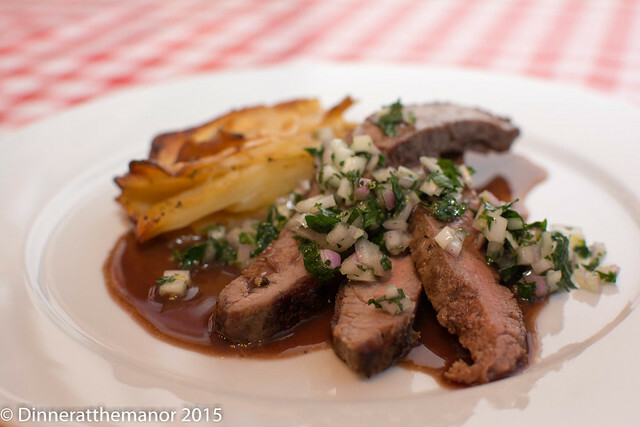 Her soft and tasty lamb loin was my favourite of the night – lovely, pink and juicy! This came with fennel, a celeriac puree and spicy rice cracker. Dessert was Liz’s take on a black forest gateau. 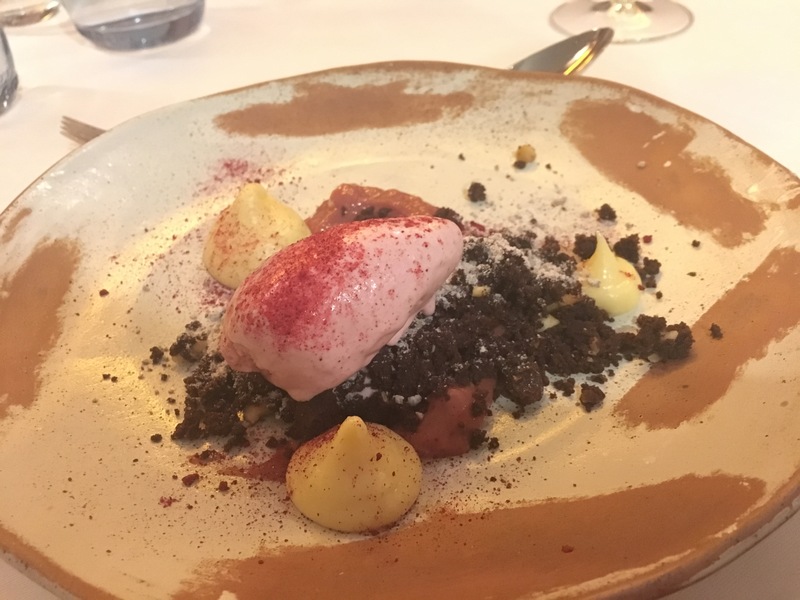 A sharp cherry ice cream was paired with chocolate soil, nuts, cherry curd and cherries soaked in kirsch. At first it was deceptively underwhelming, but a taste sensation was created when everything was eaten together – very clever indeed. So Liz will be at the New Ellington throughout October, November, December. She’ll be doing private dining Monday to Thursday evenings, if you want to book out the whole of the (small) restaurant. In addition she’ll be doing Friday lunches priced at £25 for 3 courses and a 4-course tasting menu on Friday and Saturday evenings priced at £45. I’ve often felt that Leeds does chains and cheap eats fairy well, but if you want a decent, independent, posh meal then I always struggle to know where to go. Perhaps Liz’s new venture could fill this gap? 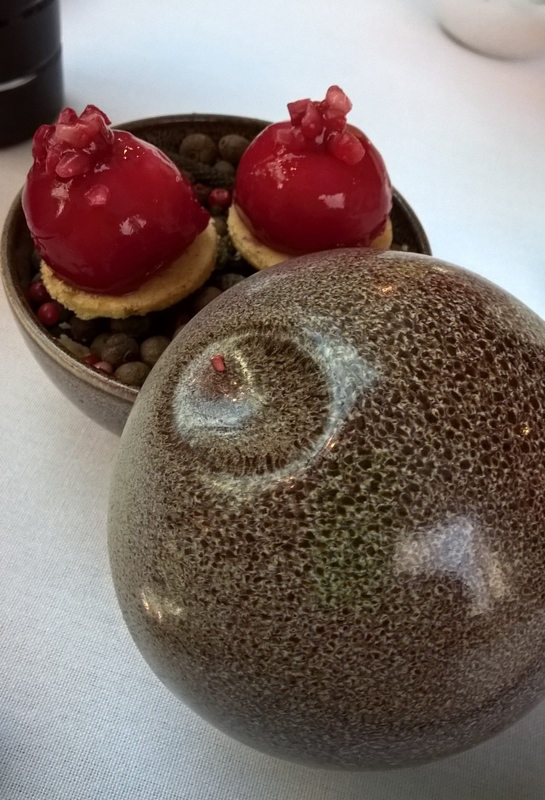 If you like modern, British cuisine cooked with passion and innovation then do give it go. What’s more, Liz intends to serve the dishes herself, so you’ll be able to get some Masterchef gossip along with your feed! Our first meal with Liz at her home was fully paid for. For our visit to the New Ellington, we were invited as Liz’s guests and the meal was complimentary however all views are our own. 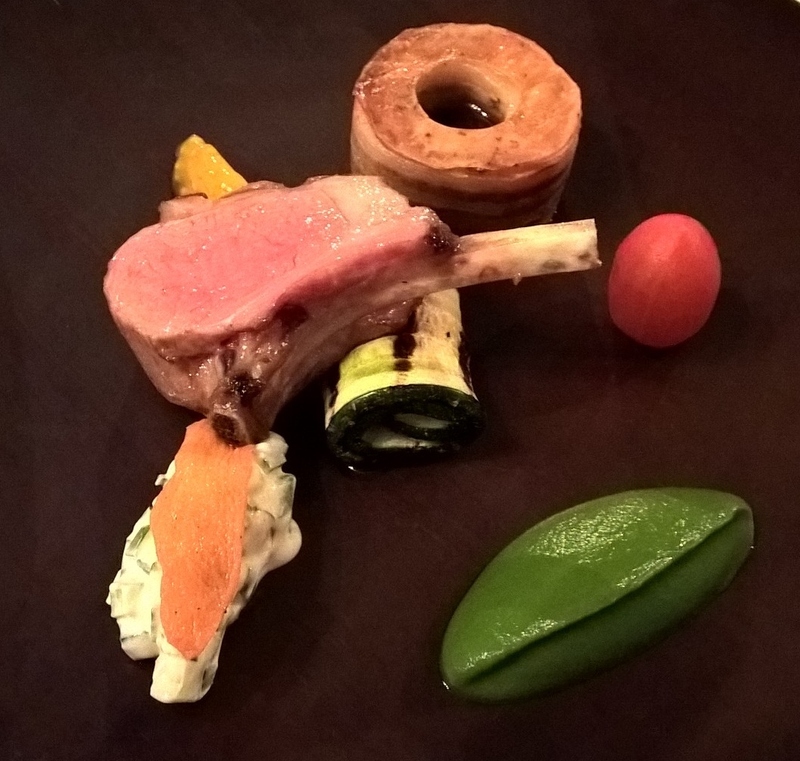 This entry was posted in Reviews and tagged Leeds, Masterchef, Restaurants, Reviews, Yorkshire on September 14, 2016 by martinimanleeds. Earlier on this month, after a small break, we hosted the first of our Summer 2016 events. Inspired by a recent trip to Florence and the sunny flavours of Italy, we decided to put on a small plates menu for our group of guests, all of whom were new faces to the Manor, which was lovely to see. 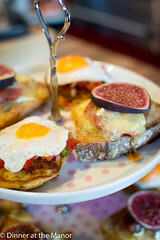 We used a range of books / chefs for inspiration, from Polpo, River Cafe, Jamie Oliver and Nigella! To welcome our guests, our aperitif was a Campom Spritz, a lovely twist on a traditional Campari spritz but with the extra addition of pomegranate and orange juices. 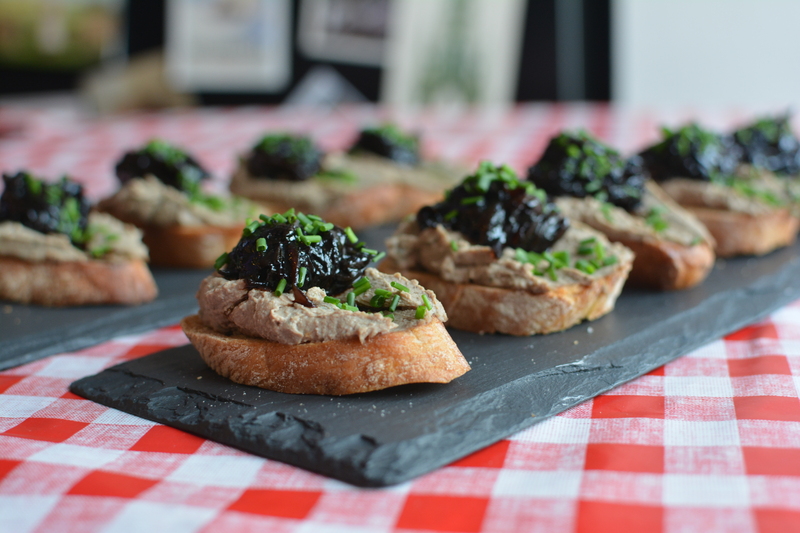 The first canape was a rich and savoury chicken liver crostini with balsamic onion – a smooth pate topped with almost black sweet reduced onions. 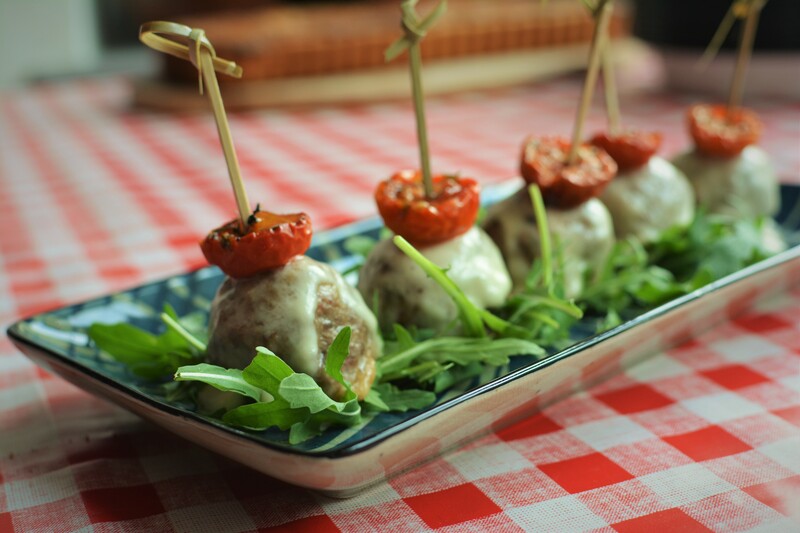 The second canape was a soft and tasty mini meatball (or polpetti) spiked with fennel and smoked bacon and topped with mozzarella, Parmesan and a semi-dried tomato. Moving swiftly on to the starters, the first was a very simple salad of roasted butternut squash, prosciutto and ricotta. 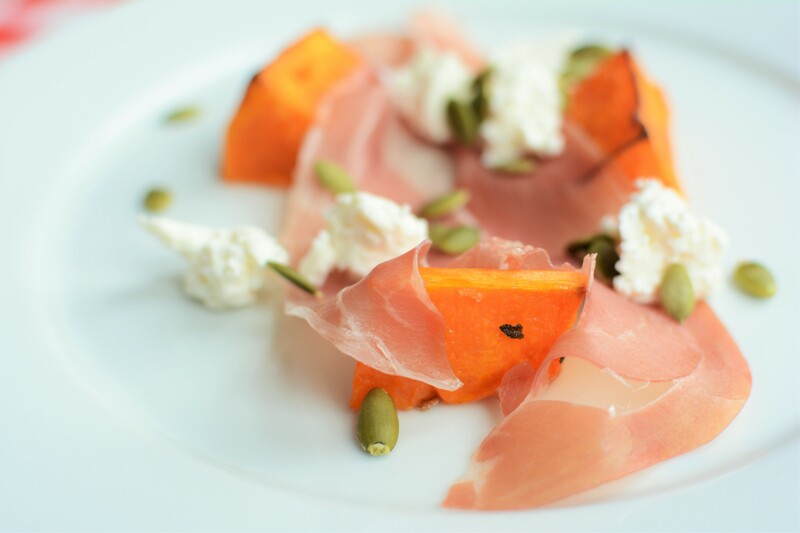 The sweetness of the squash, saltiness of the ham and the creaminess of the ricotta was brought together with pumpkin seeds for texture. Truly simple but tasty. The next starter was Dan’s less summery (but apt for the rainy Saturday we were experiencing!) dish of sprouting broccoli with a hot olive sauce and crispy pancetta. 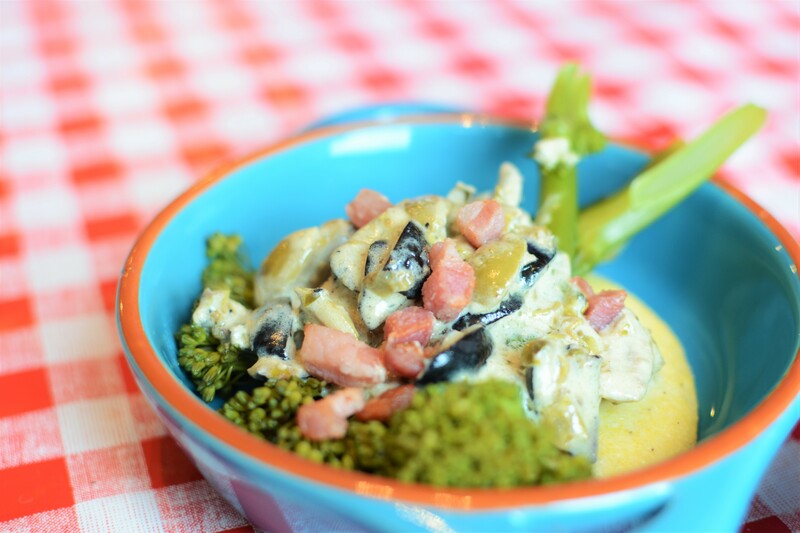 Tender steamed broccoli was served atop a dollop of rich and creamy polenta and then doused in a yummy umami sauce of green and black olives, capers, lemon, anchovies and cream. It doesn’t sound promising but trust us – this sauce is worth the gamble of slightly bonkers ingredient combinations! On to the mains, the next dish was one of the stars of the night, Dan’s chilli crab risotto. 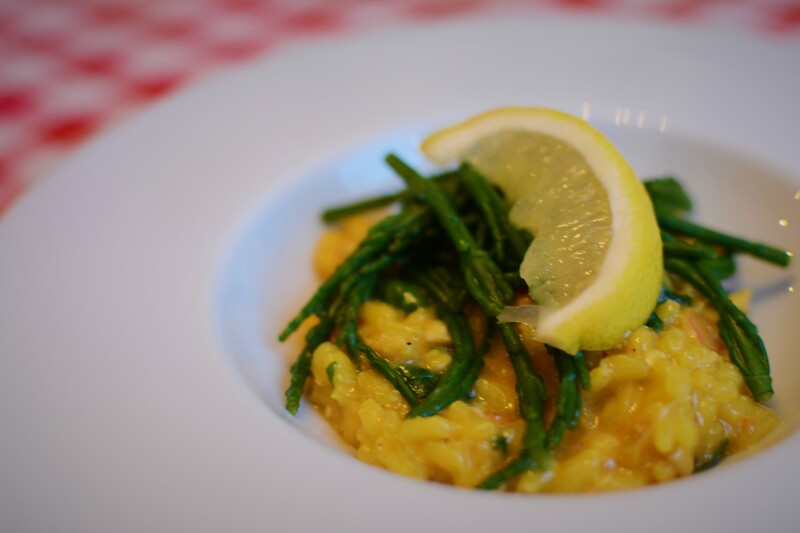 This simple recipe from Nigelissima is a creamy risotto brought to life with lots of saffron, red chilli and white and brown crab meats. This came served with some gently steamed samphire and had just the right levels of chilli heat and salty fishiness! 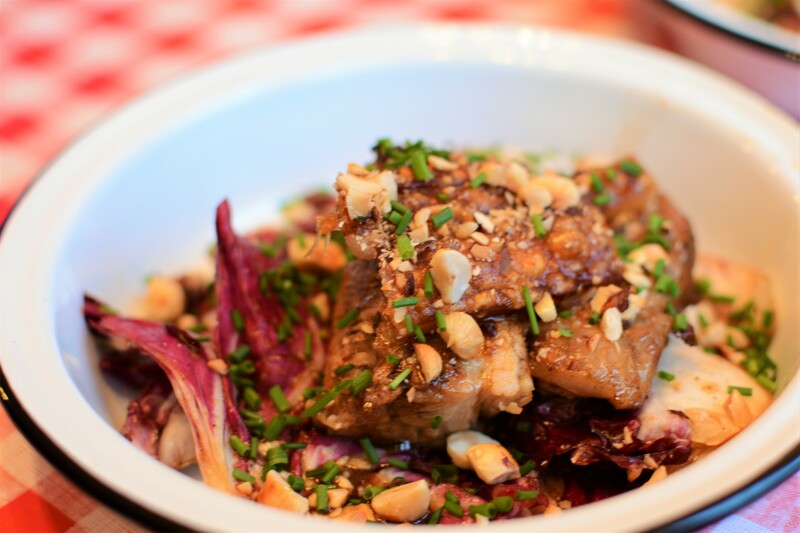 To finish the savoury dishes, was a hearty, rustic dish of pork belly, radicchio and hazelnuts. Pork belly is slow roasted for hours until meltingly soft and the skin puffed and crispy. Raddichio is then wilted in the pork juices and this is all served up with roasted hazelnuts to offset the bitterness of the leaves and add some extra crunchiness. After a palate cleanser of peach and prosecco sorbet, it was on to the dessert, Dan’s beautiful apricot, almond and lemon tart and vanilla risotto semi-fredo. 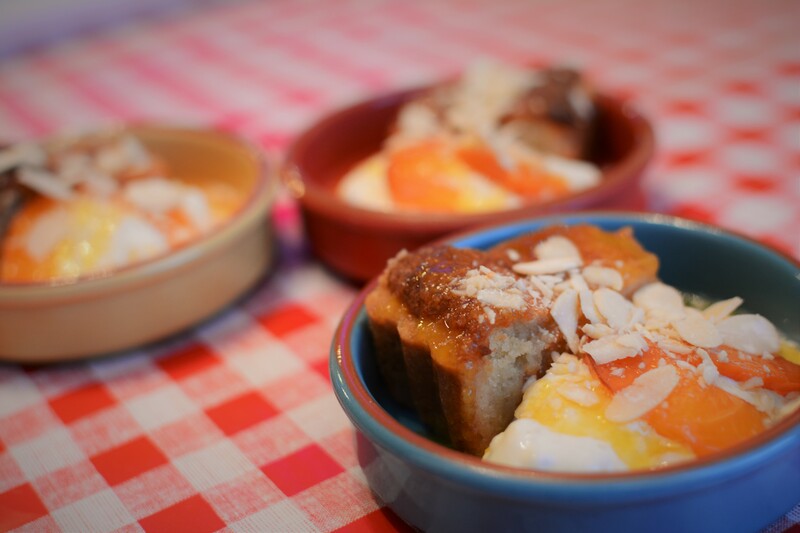 The apricot tarts are a bit like a frangipane with tons of sweet almonds to counteract the sour fruit. The semi-fredo is basically a partly frozen very creamy rice pudding, which was a wonderfully naughty accompaniment to the tart. These little sweet plates were garnished with some tangy apricot sauce and macerated apricots. 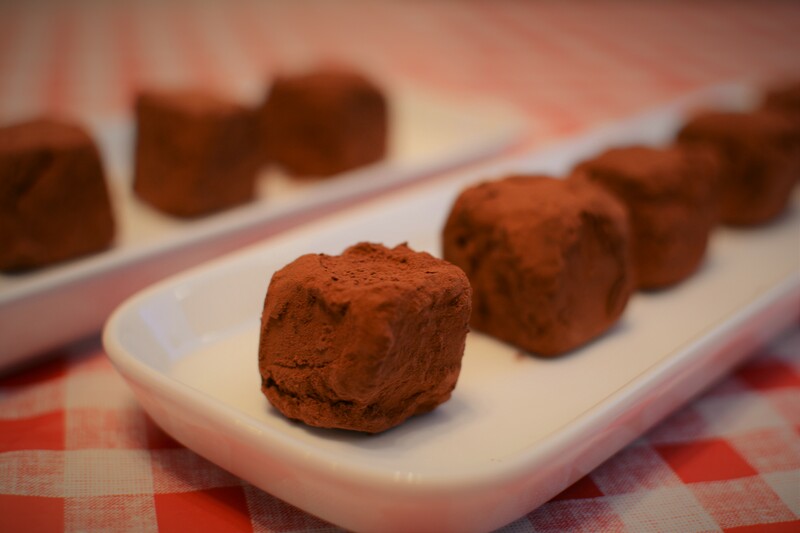 Just to finish our guests off, some boozy chocolate truffles were served up with tea and coffee. 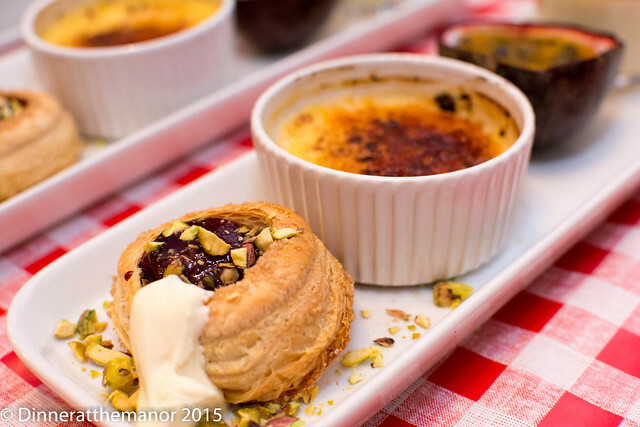 These were cram packed with delicious amaretto, creating the perfect sweet end to the meal. The whole evening was relaxed and casual, just like the food – there were no over complicated dishes here, just simple, good tasting food that allowed the ingredients to shine. Thanks to our lovely guests for a great evening. Our next event is another small plates affair, taking US diner classics to create a fun and ever so dirty menu. See you then! 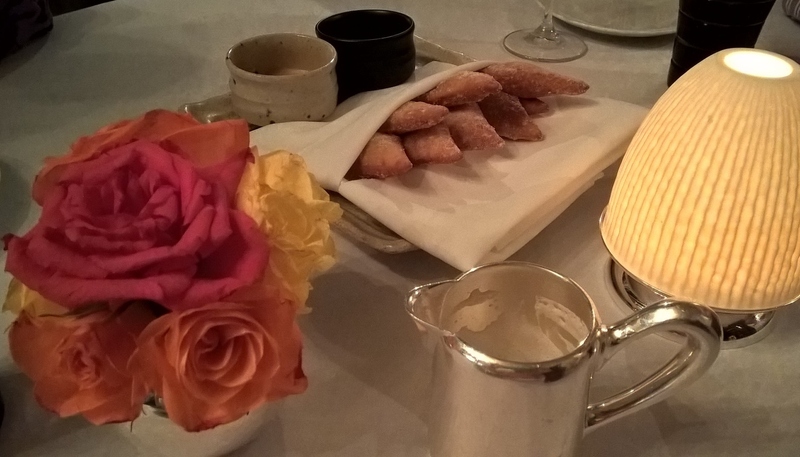 This entry was posted in Past Events, Reviews and tagged 2016 Dates, Dinner at the Manor, food, Italian, secret supperclub, Supper Club, supperclub, Underground Restaurant, Yorkshire on July 20, 2016 by Susie Barker. Last weekend we served up a lovely small plates lunch to some of our wonderful guests. Using Nigel Slater’s beautiful Kitchen Diaries III as our guide, the food was simple, yet with stunning flavours to really awaken those tastebuds. First off, our guests were greeted with our Raspberry Cooler cocktail, a delightful mix of gin, Chambord, muddled raspberries and bitter lemon. To accompany the aperitif were our canapes. First off were Dan’s Nduja bruschetta. Nduja is a rather filthy, spreadable spicy Italian sausage. 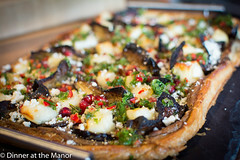 The spiciness was paired with creamy goats cheese and piquant olive for a lovely little mouthful. The other canapes were described as “apple and stilton dumplings” which were in fact little apple and stilton pies. 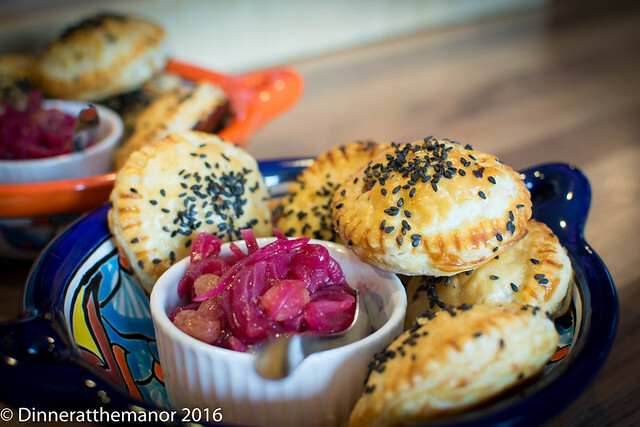 Apple puree and stilton, encased in puff pastry – these were served with a sweet and spiced red onion and golden sultana chutney. A truly delightful morsel. 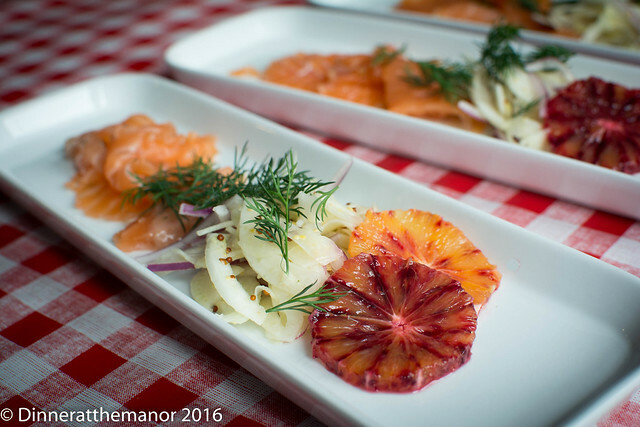 The next course was my citrus cured salmon with fennel and orange. Salmon was cured for a couple of days in salt, lemon and orange zest, dill, mint and gin and then thinly sliced. A crunchy tangy, acidic fennel salad and sliced of in season blood oranges created a dish full of contrasting flavours and textures. Griddled lamb with tomato, ginger and basil swiftly followed. This was an interesting dish where the lamb, once griddled pink, is then steeped in a marinade of the above ingredients blitzed up with lots of mustard seeds. The result is a fragrant pesto fusion which combined with the meaty lamb was a delight. 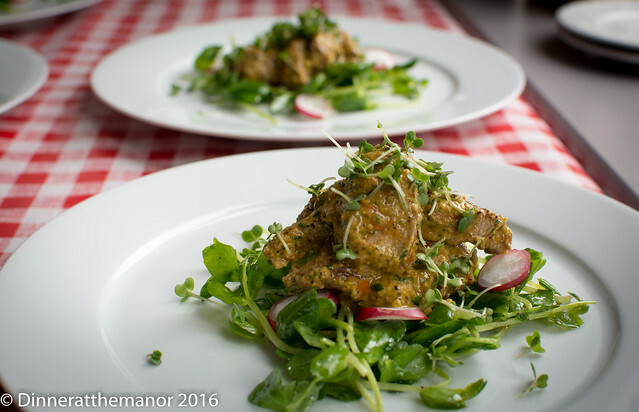 This was served with a simple pea shoot and radish salad. We then moved onto some of Nigel’s more gutsy dishes. 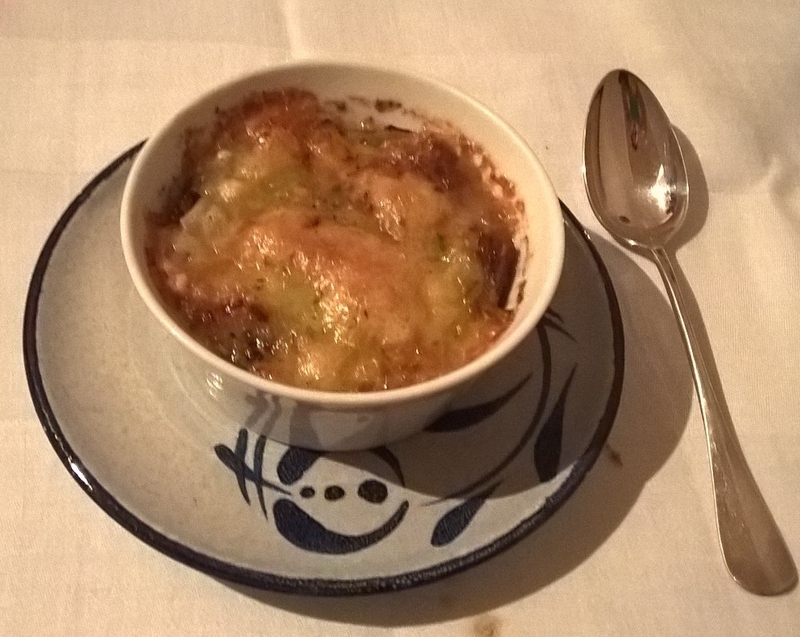 The next course was Dan’s Smoked mackerel and tender stem broccoli gratin which was creamy, warming and full of interesting textures and flavours. 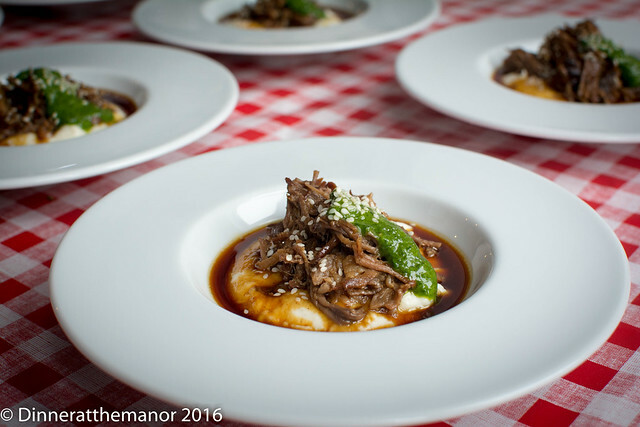 The final savoury course was a flavour sensation – beef short rib slow cooked for hours in ginger, anise, soy and apple juice. The soft meat came with a smooth cauliflower puree and lots of the delicious cooking liquor. A tangy chive puree was used to cut through the intense, but enjoyable richness of the dish. Dan’s beautiful dessert was a take on Nigel’s walnut meringue. 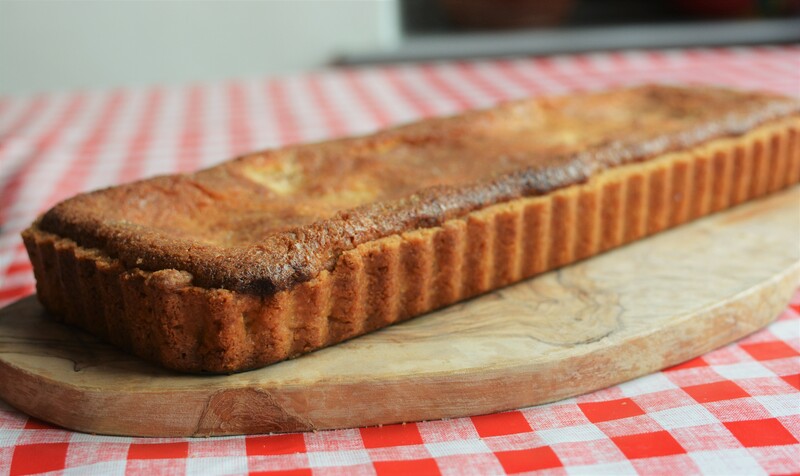 Nigel made his as a giant tray bake with apples and custard. The walnut meringue mix made lovely, chewy, nutty meringues but was quite hard to work with and so Dan deconstructed the dessert. 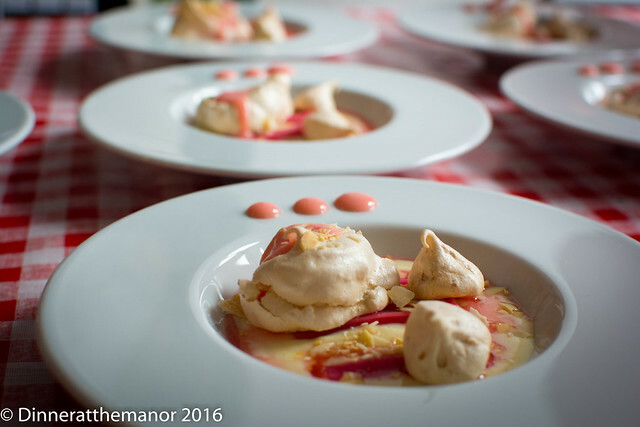 Little bowls were filled with a delicate, chilled, vanilla custard topped with gently poached forced rhubarb and then finished off with the walnut meringue, a rhubarb curd and fragrant rhubarb syrup. This was light, fresh and full of spring flavours – perfect after a heavy meal. 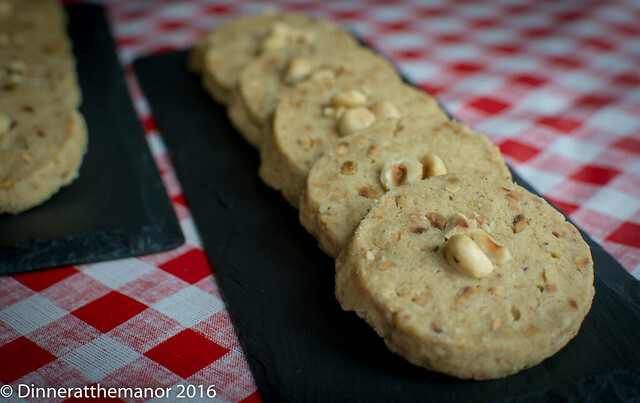 Our final flourish were my not so petit fours of maple and hazelnut shortbread biscuits, crumbly, nutty and moreish! All in all this was a fun yet really relaxed, calm affair – just like Nigel himself. If you don’t have the book, then I would recommend it, rather than a straighforward cookbook, it’s a beautiful memoir and ode to food. Thanks to our lovely guests who bought us gifts of a bay tree, sourdough starter, raw brownies and wine – you are all very kind! 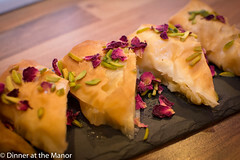 Our next event coming up will be our Rick Stein inspired Byzantine dinner. We cannot wait, see you soon! 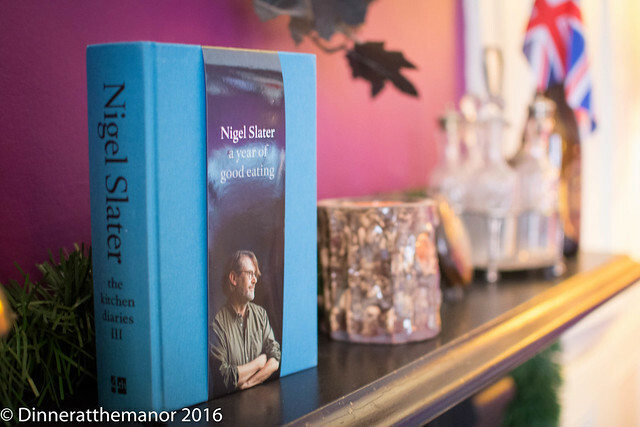 This entry was posted in Past Events, Reviews and tagged 2016 Dates, Dinner at the Manor, food, Leeds, Nigel Slater, secret supperclub, Supper Club, supperclub, Underground Dining, Underground Restaurant, Yorkshire on March 19, 2016 by Susie Barker. 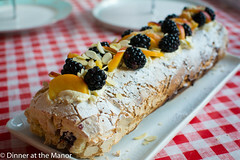 We ventured South this weekend to Sheffield to try out an exciting new supperclub run by Marie from Poppyseed dining. 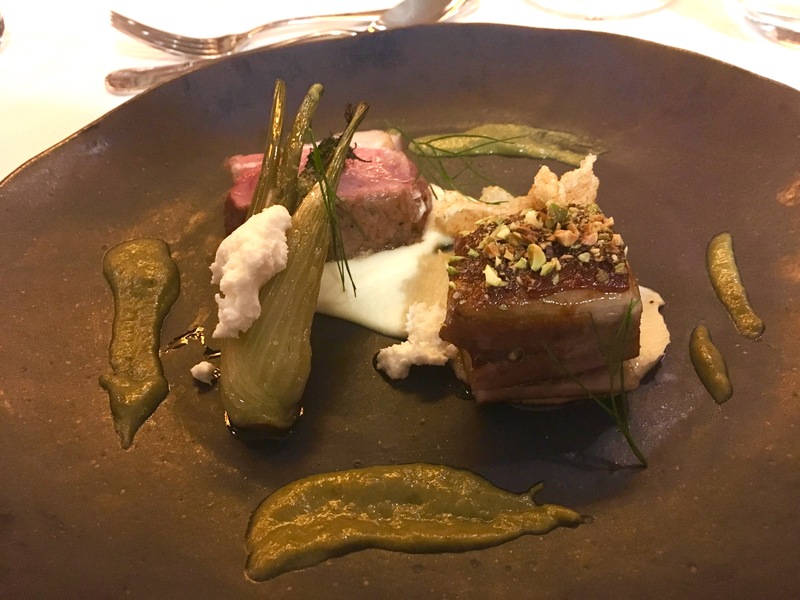 We met Marie and her husband Steve at the Swine that Dines at the start of the summer and were instantly charmed by their passion and interest in food, which meant their supperclub could be nothing more than excellent! Marie has a Bavarian background and upbringing and this is food that I don’t have a lot of experience of and so the thought of lots of warming Alpine treats was exciting, especially in the run up to Autumn! Poppyseed itself is a small affair with just six guests around the table, but given that Marie does all the sourcing and cooking herself I don’t blame her at all for this. This month’s menu was based around the food they had experienced on their recent holiday in the Italian Gran Paradiso national park. This is right on the Alpine cusp between France and Italy and is not a place I am familiar with but which I’ll certainly look into now. This was Italian food but not as you know it! On arrival at Marie and Steve’s school conversion home we were greeted with delicious glasses of berry spritz which was homemade berry liqueur topped up with prosecco. This was very light and refreshing. 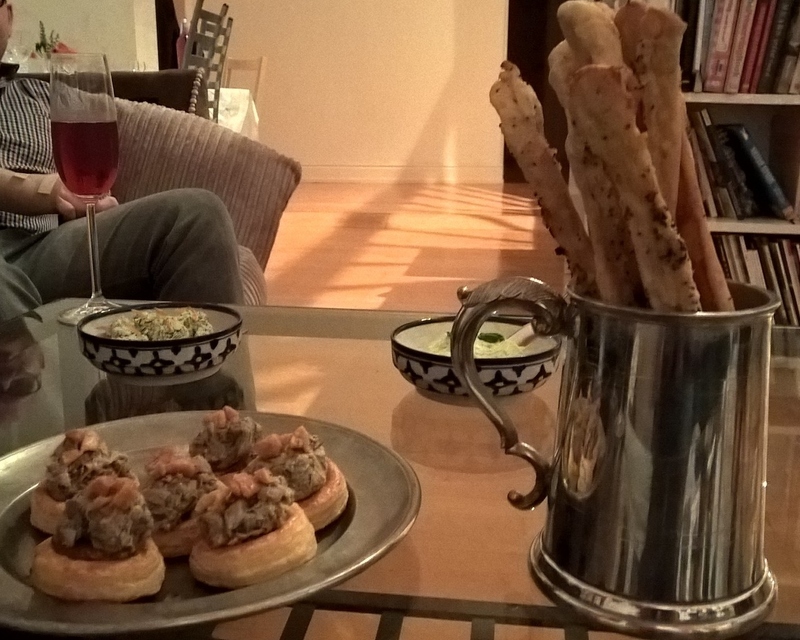 Our canapés included mini puff pastry tarts topped with succulent and salty pork rillettes, which were an absolute porky dream! Also on offer were mini puffs with Marie’s homemade ricotta! I’ve tried to make ricotta before but it doesn’t work with homogenised supermarket milk so Marie must have gone to some effort to source raw milk straight from the farm. Finally we were treated to warm grissini with a salty and herby yoghurt butter with basil. Our fellow guests were very lovely to chat to and had been to Poppyseed before so they were able to explain what the rest of the meal was likely to be like. 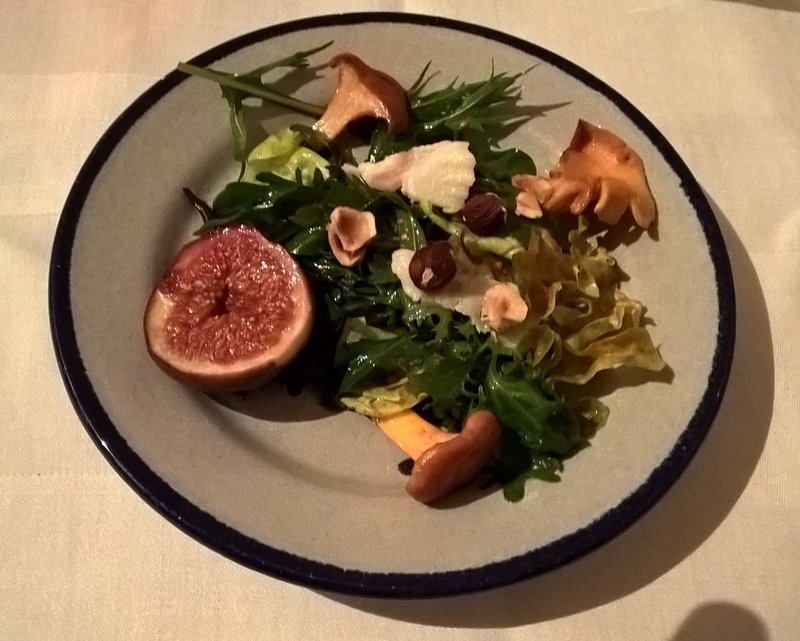 Our first starter was a lovely little salad of braised figs, hazelnut and lardo brought back from Italy. This was a light and lovely introduction to the flavours of Alpine Italy. The ingredients were simple yet well sourced. Next up was an intriguing suepa, a new dish to me! This was a cross between a baked bread pudding and a soup, if that makes sense?! Layers of homemade rye bread and fontina cheese were baked in lashings of beef broth. 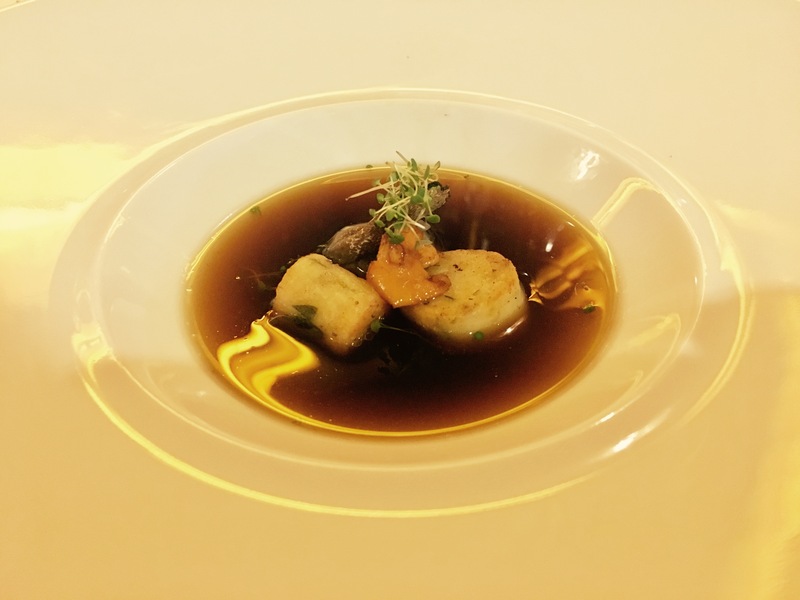 The broth was light and clear and could have been served as a consommé. This was warming and comforting yet over so rich! For our main course Marie had cured a lovely piece of beef from Whirlow Farm. This was then slow cooked with red wine and mushrooms and served up with soft polenta and caramelised onions. This dish was a bit more familiar to us. The clever curing of the meat meant it fell apart easily yet was firm at the same time. The sauce was thick and rich and almost sharp from the red wine, helping it to cut through everything. We enjoyed leftovers poured all over rye bread, mmmm! There’s no picture for this as we all dived in and devoured it before it was too late! After a small break our dessert was a cogne cream which is essentially a rum and chocolate set custard. This was probably my least favourite course as I could have done with a chocolate that was a bit more bitter and a cream that was a bit more alcoholic, as after all the strong flavours of the night this got a bit lost. 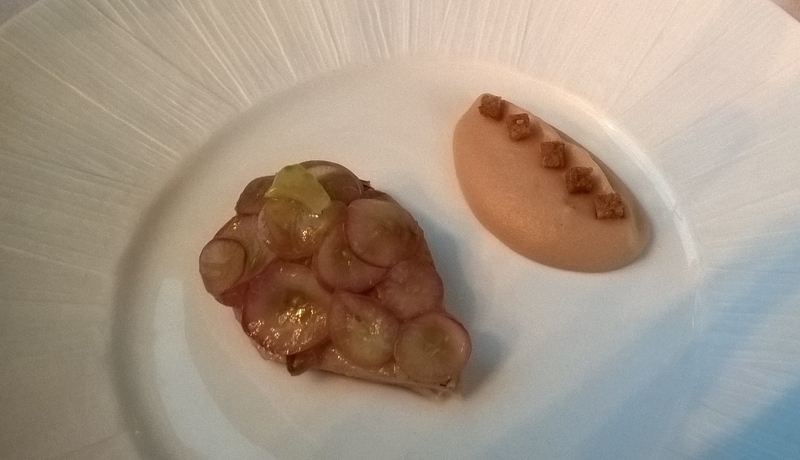 The star of the dish, however, was a scoop of refreshing pear sorbet on top. I think the pear is often forgotten about so it was good to see it here. If you dine at Poppyseed do try their coffee. Marie sources unique single bean coffees from a guy in Sheffield who scours the likes of Madagascar and Tanzania for the best coffee plantations. It is some of the best coffee I’ve ever tasted from a cafetiere. Petit four were homemade fruit pastilles that were flavoured with elderberry! These were deep and plummy. The final flourish was a little spoon of honey caramel which was a very light and tasty nougat. 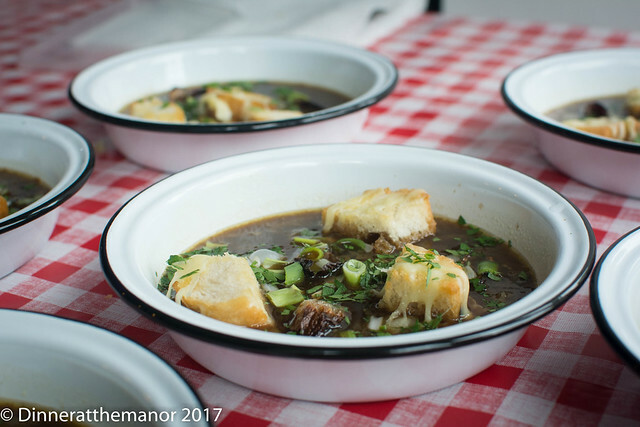 Marie’s passion for sourcing good quality ingredients is very strong and influences her supperclub throughout every single course, from the main event to the little touches such as the canapés and the coffee. This makes it extremely exciting and enjoyable to dine at because you know her heart and soul has been put into absolutely everything. How she can make any money with using such top notch fare is not clear! For us, Sheffield was not the easiest place to get to and from on a Saturday night without a car, but if you don’t mind driving or can convince someone else to then I do urge that you give Poppyseed a go. You won’t be disappointed by the beautiful ingredients and the warm and friendly hosts! 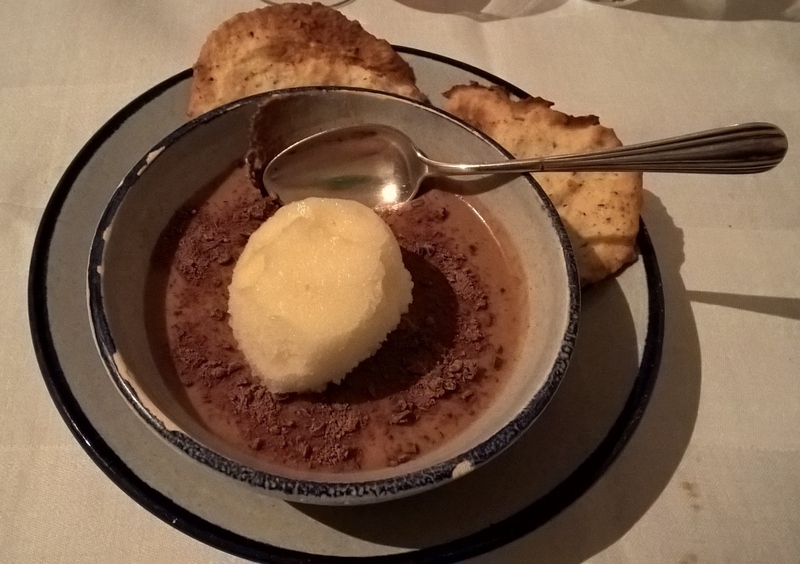 This entry was posted in Reviews and tagged Alpine food, Italy, Leeds, local food, pop-up restaurant, restaurant reviews, Reviews, secret supperclub, sheffield, supperclub, Underground Dining, Underground Restaurant, Yorkshire produce on September 27, 2015 by martinimanleeds. A Bon Evening at the Manor! 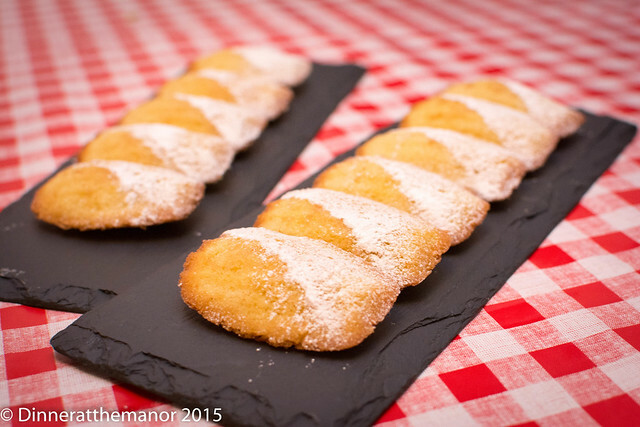 Last weekend we invited 11 guests round our table to indulge in a bit of French frivolity at the Manor. We’re off to France shortly and what better way to get ourselves pepped and ready to go than with a delicious eight course menu celebrating all things French. Using Rick Stein’s French Odyssey as our guide (which is twenty years old this year!) we served up a delightful array of dishes. Our cocktail was le diner au manoir, an unusual concoction of orange, gin, pernod and sparkling water with a dash of grenadine for colour and sweetness. We served this from our retro punch bowl. This delicious aperitif was paired with three canapés. 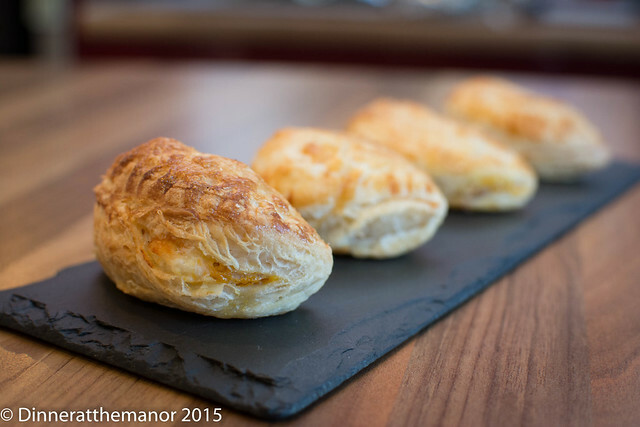 Firstly little puff pasty parcels filled with roasted butternut squash, thyme and goats cheese, an adaptation of a pumpkin soup recipe from the book. This was swiftly followed by little crunchy croutes topped with tapenade and a baked mushroom. 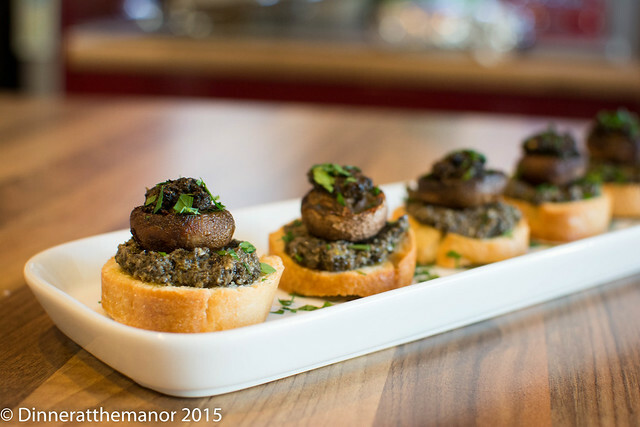 The earthy mushroom paired surprisingly well with the salty, umami flavours of the tapenade. 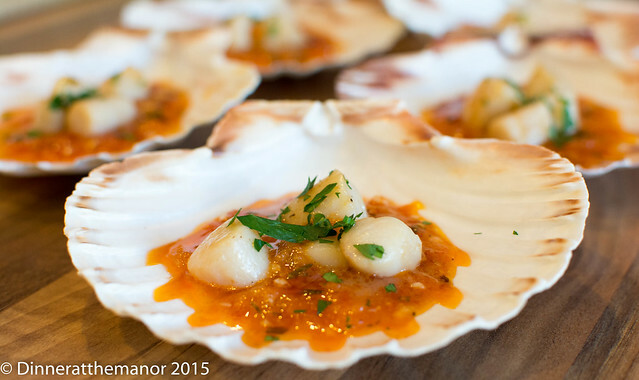 The third canapé were flash fried queenie scallops served up with a delicious tomato and herbes de Provence dressing. 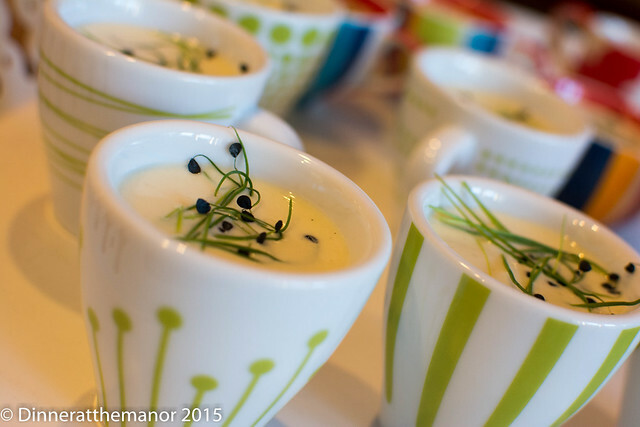 After canapés came the amuse bouche, little cups of vichyssoise, or cold leek and potato soup to you and I! This is a decadent creamy and smooth soup with the unmistakable savoury notes of leek and white pepper. These came topped with fun little garlic chives. 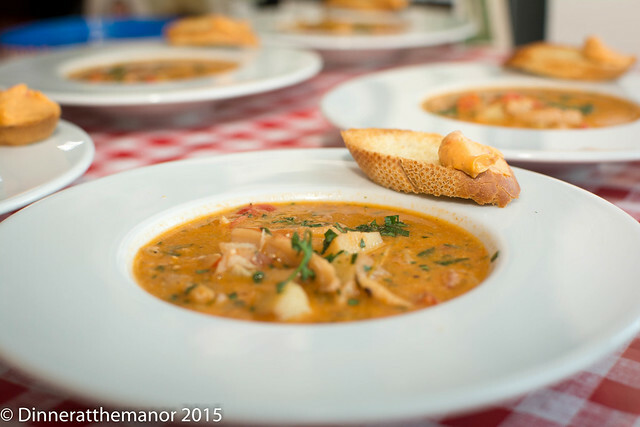 Next up was the starter which was Dan’s take on a bouillabaisse, a French fish stew. 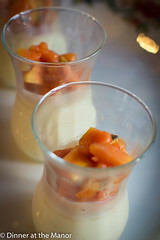 Dan’s summery version came spiked with the flavours of orange, anise, tomato and pepper. The fish, fresh from Leeds market, was squid and crab. The squid is cooked long and slow to make it mouth-wateringly soft. Just before serving a rouille – which is a spiced garlic mayonnaise – was stirred through to add even more depth of flavour. These came served with a little baguette crouton and a further smear of rouille. After a bit of respite of our guests, the main course was served. This was bavette steak (beef skirt from the brilliant Keelham Farm shop) cooked pink, accompanied with a rich, glossy Bordelaise sauce and a shallot and parsley “salsa” to cut through the richness. This was paired with pommes coq d’or – sliced baked potatoes in stock and a Cheesemaker’s salad, which doesn’t actually contain any cheese! Tender leaves and pink pickled shallots tossed in a tart mustard dressing. Again, this did a great job of cutting through the richer elements of the dish. To cleanse the palate, next up was little scoops of Normany cider sorbet. This was fresh green apples pulped in the juicer and strained before being added to a sweet cider syrup and churned to make a bright green and refreshing sorbet that had the unmistakable taste of tangy apple and cider! 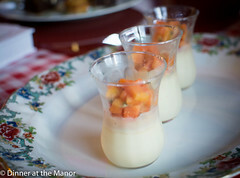 Our final flourish was Dan’s Trois Petit Desserts, which actually turned out to be four! Dan put his patisserie skills to the test making nearly every single dessert in Rick’s book! First up was a caramel mousse, which is a light and airy mousse flavoured with buttery salted caramel. This came topped with fresh strawberries and crunchy almond brittle. It wouldn’t be a French meal without some form of crème brulee, and this time it came in the form of a passionfruit brulee. Passionfruit puree was mixed into the custard before being baked to produce a subtly flavoured creamy delight. Interestingly Rick uses icing sugar for his burnt top, and it works a treat! You have to work quickly before the sugar dissolves but it melts easily and cracks up a treat. It did mean we had to get out Dan’s scary, industrial sized blowtorch, which had us all running to protect our eyebrows! The brulee came paired with a passionfruit shell filled with passionfruit jelly. This was a really cute addition to the plate as it looked just like a passionfruit and was really effective and pretty. Finally to ensure there was some pastry to munch on Dan concocted a mini pear tart. 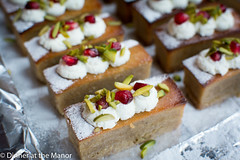 Crisp puff pastry was filled with poached pear and topped with a red wine glaze, chopped pistachios and a dollop of crème fraiche. 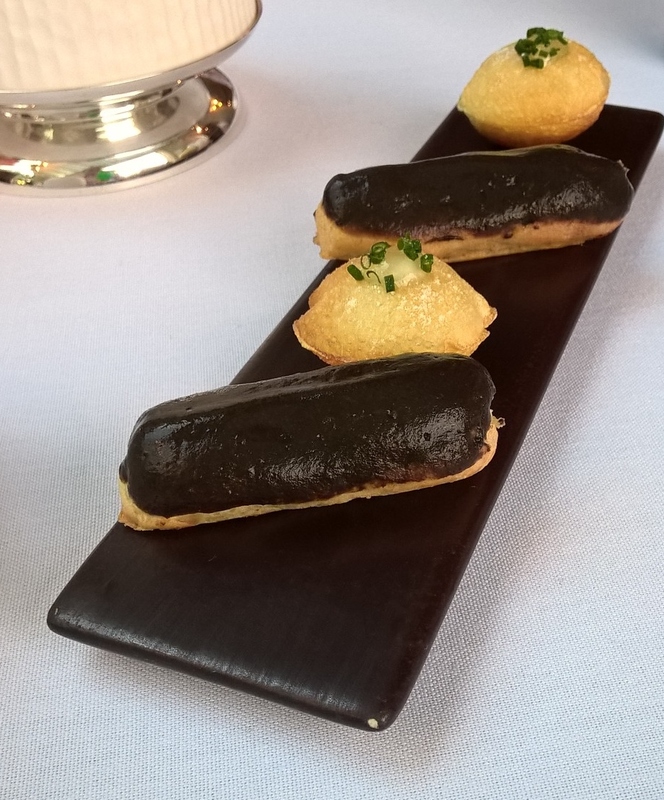 Finally, our petit fours for the evening were little honey and lemon madeleines, light and fluffy, but may have tipped some of our guests over the edge! To sum up, this was a very enjoyable event, as usual our guests were a lovely bunch who were well up for tucking into the huge amount of food we threw their way! Rick Stein’s book is a classic, with all of the dishes flavoursome and relatively simple to make using very simple ingredients. Vive la France! We’re taking a bit of a break in September, but we’ll be ready and raring to go in October for our 4th birthday (gulp!) event – Japanese soul food paired with delicious Beavertown Beer! 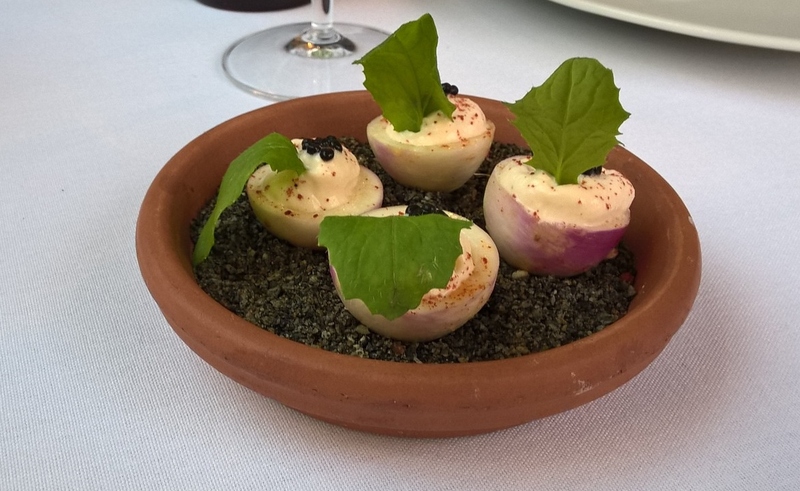 This entry was posted in Past Events, Reviews and tagged 2015 dates, Dinner at the Manor, French, French Food, Leeds, Rick Stein, Supper Club, supperclub, Underground Dining, Underground Restaurant, Yorkshire on August 23, 2015 by Susie Barker. I grew up in Cambridge and so have always known of Midsummer House. But it was one of those places I never expected to go to, and was a bit intimidated by. It was the kind of place corporate business men took clients to show off a bit, not the place for locals to go for a meal, not even for a special occasion. However 15-20 years on and Midsummer House has become far more accessible with Daniel Clifford at the helm as chef patron and a string of successful appearances on the Great British Menu. It was one of these Great British Menu appearances that got my attention and made me think, yes that food looks fun, I want to eat there! Plus it has managed to retain its 2 Michelin stars for the last ten years. As the name suggests, Midsummer House is a house and it’s based on Cambridge’s midsummer common. Cambridge is a funny old city with a number of protected commons, which are basically large areas of grazing land for wild cattle, which have the effect of making you feel like you’re in the middle of the countryside and not in the middle of a city. 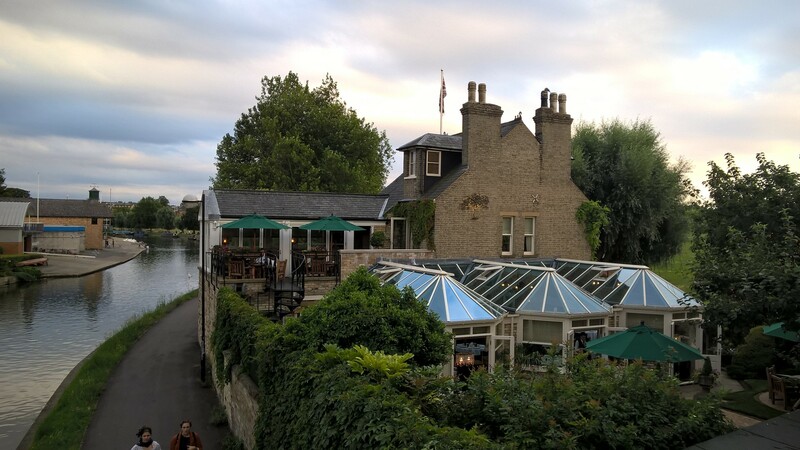 Midsummer House is located with the river Cam on one side and the common on the other. This sedate positioning means that cars cannot access the restaurant and in fact our taxi had to leave us at the edge of a footbridge to continue our journey by foot, which was quite nice and romantic. The restaurant itself is surprisingly small, extended through the use of a conservatory and garden. As it was a lovely day the conservatory doors and windows were flung open giving us a feel of siting out in the garden. 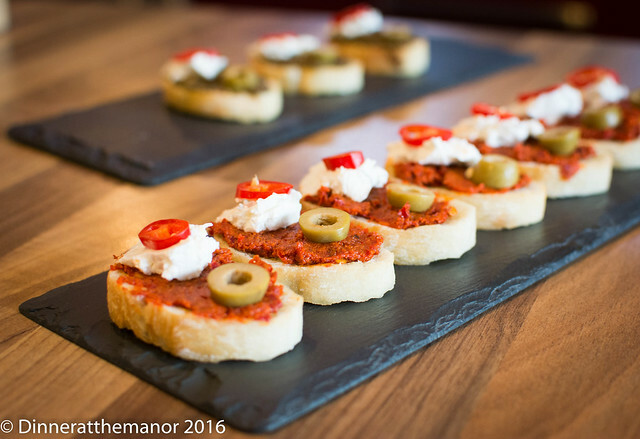 Our first canapés were delivered whilst we waited to see what would happen next. 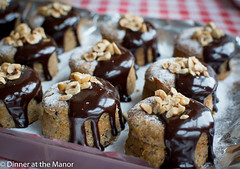 Little choux buns were filled with a truffle cream and looked just like mini chocolate éclairs! We started the meal with a glass of champagne which was brought to our table aboard a slightly pompous champagne trolley. This mechanical trolley magically presented the champagne from the depths of its cupboards, which was fun but a bit cheesy. The champagnes, however, were all dry and crisp and extremely refreshing. More canapés appeared including mini turnips in a pepper soil and smoked fish pate and a duck pate on a crumbly biscuit and encased in a pleasingly sharp redcurrant gel. Both were beautiful and full of flavour. The menu is split into 7 courses or 10 courses depending how greedy you are. I was with my family who are not always big eaters and so I had to heartbreakingly agree to the 7 courses. This was tough as the courses we were giving up included the suckling pig and turbot with clams and squid ink pasta – devastating! 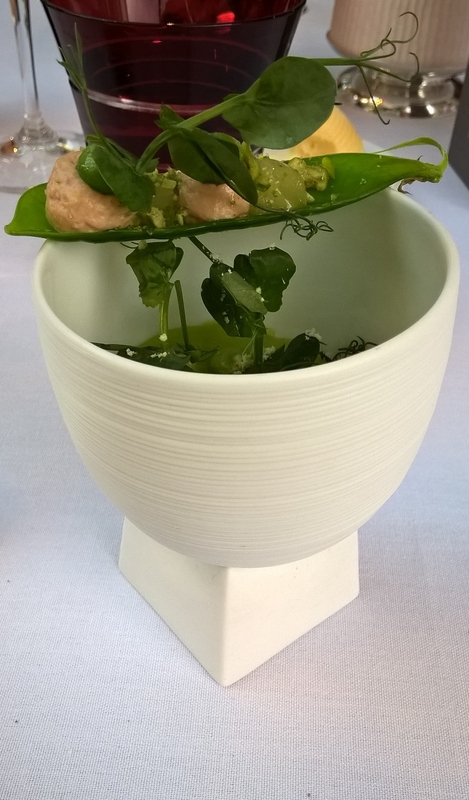 First up was a crab and pea dish, presented in a hovering little round bottomed dish. Full of crisp, green pea flavour and sweet, comforting crab this was a celebration of the British summer at its best. I was astounded by the superb flavours that had been captured in such a simple looking dish, and this was to start a theme for the rest of the meal. I had spied a little BBQ as soon as we had sat down and for our next course this was brought over to us by the head waiter on another little trolley. 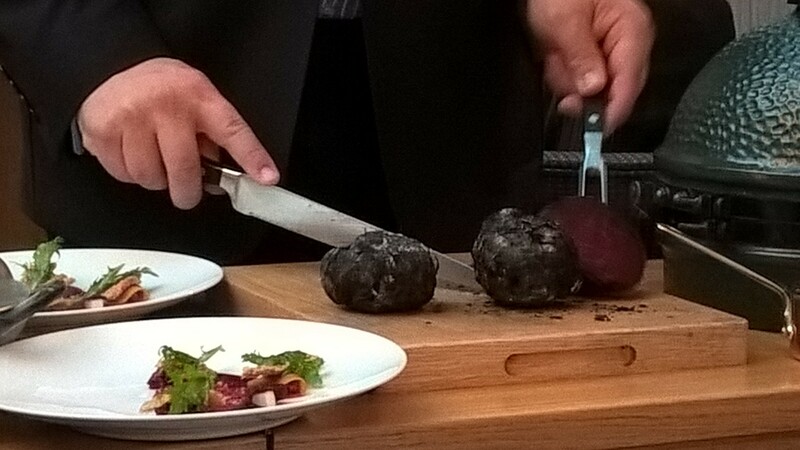 Inside the BBQ dome were a number of charred and wrinkly beetroot. 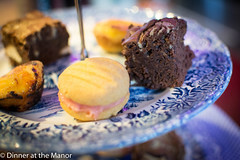 These were sliced up with as much pomp and ceremony as could be mustered! The tender flesh was scooped out and added to our next dish of beetroot, goat cheese and quinoa. Beetroot is probably my least favourite vegetable but even I could appreciate its soft juiciness. The goats cheese was fresh out of Heston’s lab, frozen within an inch of its life in dry ice and steaming away on our plates! 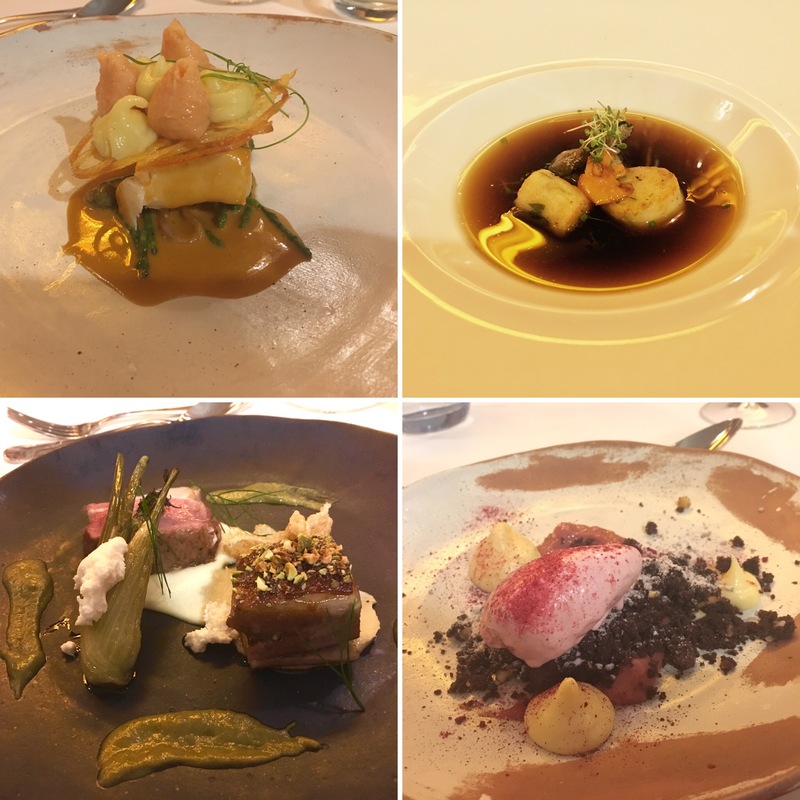 Next up was my favourite course – quail three ways! A beautifully rare and succulent quail breast was paired up with a sourdough toast finger spread with quail pate and a little deep fried quail egg. The meat was melt in the mouth, the pate umami at its best and the egg smoky beyond belief and full of skill, yum! Finally for the savouries was perfectly pink Cumbrian lamb. For me this was probably the least exciting course but this is mainly because it had such a tough act to follow after the high standard that had preceded it. 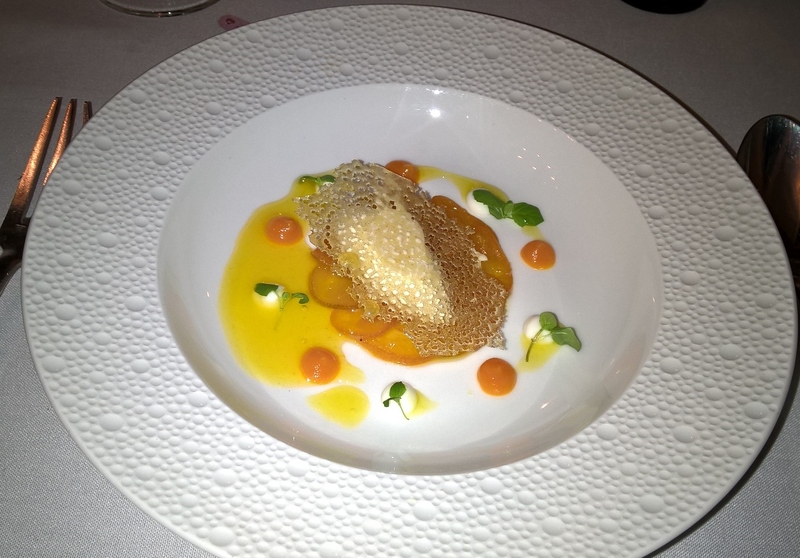 Our first dessert was poached kumquat with tamarind sorbet. This did have the effect of cleansing our palettes and caused all manner of yum noises round the table. I felt there was a little bit too much kumquat for the size of the dish, to the point where it felt like I was eating a bowl of marmalade, but it was tasty nonetheless. 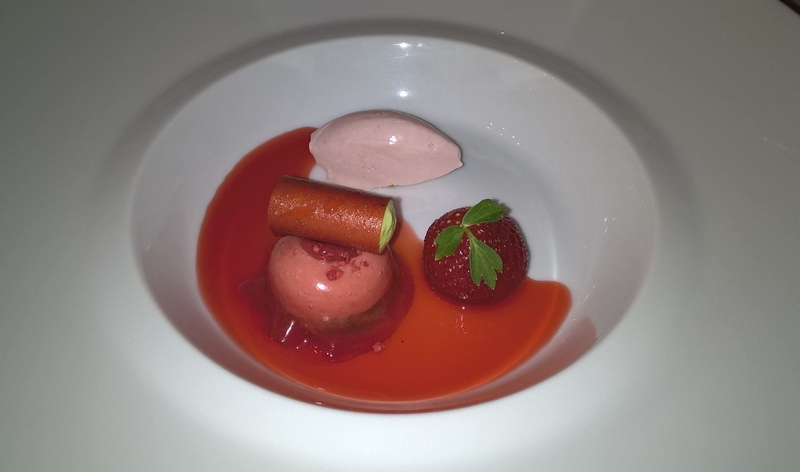 Our final dessert was a celebration of strawberry – who knew a simple strawberry was harbouring so much flavour! This included a little macerated strawberry, a ravioli coated in strawberry gel and a little cigar of strawberry. This was light, fruity and summery – just what we needed after a fairly rich meal! Coffees were not obligatory to enjoy the petit four. These were light little diamond doughnuts with caramel and calvados dipping sauces. The sauces were so good I was eating the leftovers with a spoon! And so that brought a very enjoyable meal to a close. 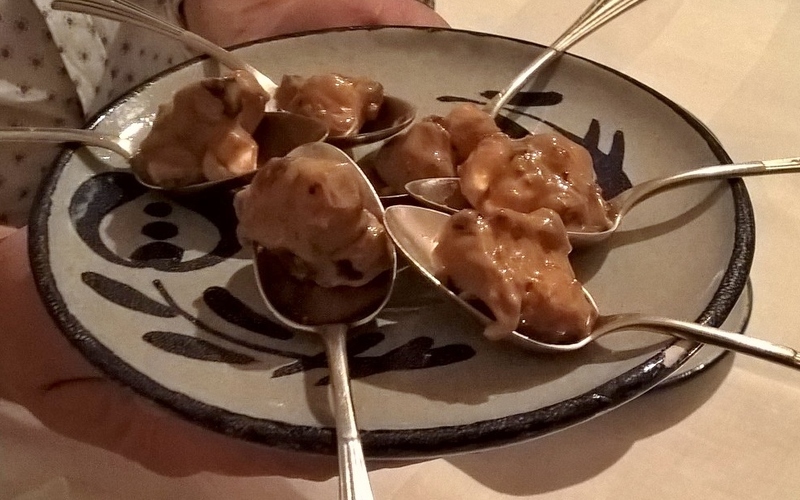 Everybody agreed that they had been pleasantly surprised by the standard of flavours and the fact that we had been served generous courses and were perfectly full. Had I been offered the additional turbot and pork I’m not sure I could have fitted these in, so maybe 7 was the magic number?! If I had any criticisms, and these are minor, it’s the toilet set up. For a medium sized restaurant (there’s at least 20 covers downstairs and a private dining room upstairs) there is only one male toilet and one female toilet, which is just not enough. I dashed to the loo just as the scallop was coming out and then had to queue, delaying the dish even further which I’m sure stressed the kitchen out. Also, whilst we were sat right next to a lovely open door that looked out on to the common, we were also right by the drains. So every now and then a lovely whiff of sewage greeted us. This wasn’t enough to cause us to ask to be moved but it does indicate that the restaurant’s toilet infrastructure is not quite right. I was very impressed with the staff who were all very professional but also friendly and jolly at the same time, making the meal feel special. As we went to leave we were given a parting gift of a little box of chocolates. The chocolate work was obviously the hand of an expert as they were so thin. 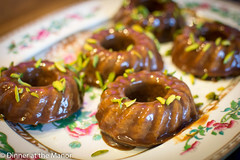 The insides were, again, superb flavours of pistachio and passionfruit. So if you want a meal where you’ll be thinking of and talking about the flavours long after then do try out Midsummer House – just avoid the private dining room (it looked soulless to me) and don’t sit too near the drains if the doors are open! 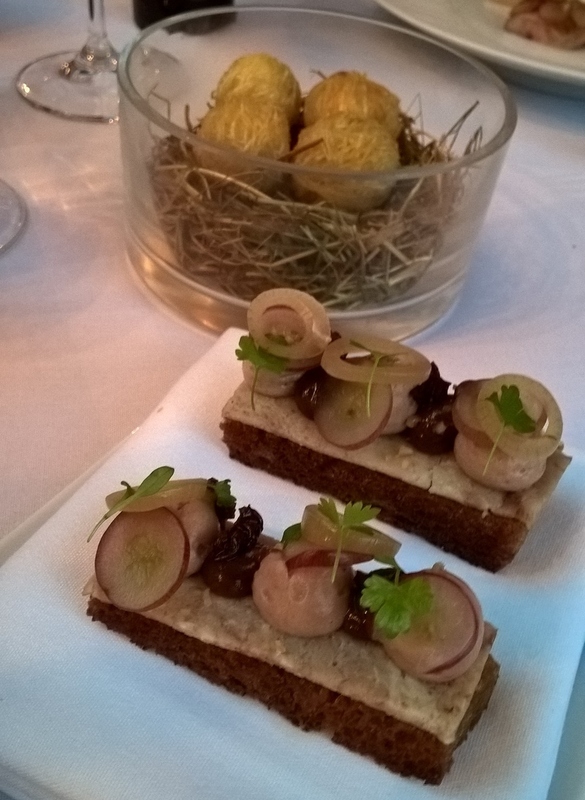 This entry was posted in Reviews and tagged 2015, cambridge, Dinner at the Manor, fine dining, Michelin star dining, midsummer house, restaurant reviews, Restaurants, Reviews, supperclub on August 9, 2015 by martinimanleeds.